Meeting Facilitation: Don't Just Do Something--Stand There! Your Relevance: Do You Matter? When bosses are abrasive, everyone loses. The good news is that they can change. An expert tells you how. "You have either tried everything you can think of to tame the abrasive manager's agressive behavior, to no avail, or are too afraid to try anything, for fear of what could happen. Let me tell you why they do what they do, and what you can do about it." You must be a Member to listen to this Interview. Dr. Laura Crawshaw, also known as The Boss Whisperer® founded the Executive Insight Development Group in 1994, a firm that specializes in coaching abrasive leaders at all levels. Executive Insight has served an international clientele of corporations over the past fifteen years, including over 40 Fortune 500 companies. Having founded The Boss Whispering Institute in 2009, Laura now focuses her research and practice on the reduction of workplace suffering by training other executive coaches in this specialty. 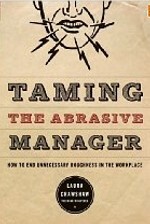 Her book, Taming the Abrasive Manager: How to End Unnecessary Roughness in the Workplace (Jossey-Bass Publishers), was released in 2007. Dr. Crawshaw is a past executive, holds degrees in clinical social work and organizational behavior, and is a member of the International Coach Federation, the International Association on Bullying & Harassment in the Workplace, and the American Psychological Association.